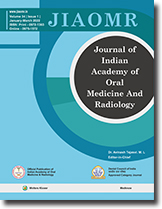 Higher incidence of oral cancer and precancer in Indian population necessitates in depth probing of various etiological and contributory factors for its early diagnosis and prognosis. In the present study serum iron, copper, zinc levels and Cu/zn ratio were estimated in control and study groups [oral leukoplakia (OL), oral submucous fibrosis (OSMF), oral squamous cell carcinoma (OSCC)]. Estimation of these trace elements was done by colorimetric method using semi automated analyzer. Serum iron level and Cu/Zn ratio were significantly reduced while serum copper was increased significantly in OL, OSMF, and OSCC. The comparison of these trace elements between study groups was also found to be significant. Thus, assessment of Cu, Zn, Fe and Cu/Zn ratio can be used as auxiliary test to clinicopathological diagnosis and prognosis of oral precancer and cancer. Objective: To study the blood pressure range in 1200 dental patients, at the PMNM Dental College and Hospital, Bagalkot. Material and Methods: A total of 1200 screened, 248 patients were studied for hypertension (HTN) status. Data collected using specially prepared proforma, with provision for recording of blood pressure. Inclusion criteria were diagnosis of HTN by a physician or presentation of patient with systolic blood pressure reading greater than 140 mm Hg and diastolic blood pressure greater than 90 mm Hg. Results: Out of 1200 patients 248 patients met the inclusion criteria, 102 were previously diagnosed (57 males and 45 females) with HTN and 146 were undiagnosed previously (99 males and 47 females) but exhibited elevated blood pressure level Out of these 146 undiagnosed patients only 87 reported back after getting investigated and diagnosed as hypertensive by physician The prevalence of diagnosed HTN in the study population was 15.75%. When the 59 subject who exhibited elevated blood pressure were included, the prevalence of HTN was 20.6%. At the initial screening 8.5% of diagnosed patients and 12.2% of undiagnosed patients exhibited a high blood pressure level. Conclusion: As significant numbers of patients with HTN are visiting dental institutions, routine blood pressure measurement for all dental patients is required. Presence of high blood pressure justifies medical examination in dental patients, to prevent complications during dental treatment. Many subjects examined were unaware of their high blood pressure levels: caution is required prior to performing dental procedures. The main aim of this study was to evaluate and compare the ossification of the midpalatal suture using cross-sectional maxillary occlusal radiograph and computerized tomographic scan of the hard palate in the axial direction. The percentage of the ossification thus obtained was correlated with the skeletal maturation indicators like (CVMI categories and MP3 stages) in Group I subjects (8.0-16.0 years) and with chronological age in group II subjects (16.1-25.0 years). The radiograph of the middle phalanx of the third finger and lateral cephalogram in occlusion were taken for the Group I subjects. The total sample size of the study comprised of 21 subjects with transverse maxillary deficiency. The percentage of the ossification of the midpalatal suture was calculated using suture obliteration index described by Persson and Thilander. The results of the study revealed that the total amount of ossification of the MPS in Group I subjects with computerized tomographic scan (22.56 ΁ 3-62%) was significantly less compared to cross-sectional maxillary occlusal radiograph (5822 ΁ 3.79) at the end of skeletal maturation (p < 0-001). There was sudden spurt in the ossification of the MPS after CVMI category 4/MP3 H stage. In Group II subjects CT scan again showed significantly less amount of the ossification (40.78 ΁ 19,73) compared to maxillary occlusal radiograph (60.32 ΁ 14,41) in the total length of the MPS (p < 0.05). Thus CT scan of the hard palate showed less than 50% of the midpalatal suture ossification at the age of 25 years approximately. This was due to advantages of the computed tomographic technology. i.e. no superimposition of the overlying and adjacent structure, exact localization and accurate assessment of the MPS ossification over the conventional radiography. Background and Objectives: Oral submucous fibrosis (OSMF), A chronic disease characterized by fibrosis of oral mucosa is a premalignant condition carrying a high-risk of malignant transformation. So far none of the treatment modalities have proved curative. Turmeric and its active ingredient "curcumin" are being studied upon as chemopreventive agents in various diseases. This study was carried-out to evaluate the efficacy of turmeric dispensed in two forms, namely curcumin capsules and turmeric oil in patients with OSMF both clinically and histopathologically and to compare them with conventional chemopreventive treatment Materials and Methods: Forty eight patients who were clinically and histopathologically confirmed as having OSMF were selected for the study and were randomly divided into three groups. Group I patients were given curcumin capsules. Group II turmeric oil and Group III: the control group were provided with muttinal tablets. The patients were called upon every 15 days for 3 months of treatment and then followed up every month for 6 months. The results were analyzed with Anova Technique and Students" test. Results: After treatment and follow-up statistically significant improvement was observed in the clinical signs and symptoms of patients treated with curcumin and turmeric oil when compared to those with multinal. Positive changes were also observed in the histopathological examination after treatment with curcumin and turmeric oil. Conclusion The therapy with curcumin and turmeric oil is beneficial, affordable and noninvasive form of treatment in patients with OSMF. Ectodermal dysplasia represents a rare syndrome affecting two or more ectodermally derived structures. The condition is thought to occur in approximately 1 in every 100,000 live births. It affects men more frequently and severely, while women being the carriers and heterozygote usually show minor defects. There are more than 150 different variants of ectodermal dysplasia (ED) reported in the literature. Most commonly encountered among them is hypohidrotic ED which frequently exhibits the most severe dental anomalies like hypodontia or anodontia along with hypohidrosis and hypotrichosis. Here we make an attempt to collectively report and discuss eleven South Indian patients who reported to our department during the year 1998 to 2004. An added emphasis is laid on family history of consanguineous marriage among the parents of these patients. The genial tubercles are a group of bony extensions that surround the lingual foramen bilaterally in the midway between the superior and inferior borders of the lingual surface of the mandible. Enlargement of genial tubercle occurs very rarely due to hypertrophy. This article focuses on a rare case showing hypertrophy of the genial tubercles. Many lesions that occur in the jaw have a similar radiographical appearance and it is often difficult to differentiate among them. Despite development of various cross-sectional imaging modalities the radiograph still remains the first and the most important investigation. Radiographical evaluation of jaw lesion characteristics, which include location, margin, density, relation to tooth, along with knowledge of the clinical data, generally helps in narrowing the diagnosis. With advancing technology today the mutti-row scanners are used for an increasing number of indications for routine examinations. Most major research facilities use 64-slice scanners on a routine clinical basis. Computed tomography (CT) scans are not ideal for imaging soft tissues such as muscles, joints or brain, but are perfect for detecting air or calcium. CT provides very good spatial resolution, that is the ability to distinguish between two separate structures that are very close together. But precision in identifying these calcified structures could be upregulated by the use of this normal routine specialized technique along with a software, which uses in its principle methods to quantity and qualitate the density. Nonsyndromic familial hyperdontia/supernumerary teeth is a rare disorder of odontogenesis characterized by an excess number of teeth with familial background. They can be supplemental (resembling natural teeth), conical, tuberculate or molariform Early clinical and radiographic examination of the supernumerary teeth allow for optimal yet minimal treatment. This article reports two rare cases of nonsyndromic hereditary hyperdontia both in the maxillary anterior region. First case report with bilateral mesiodentes palatal to the central incisors in sister and brother and second case report with presence of fused mesiodentes in father and conical mesiodens in son. Though the exact etiology of this dental anomaly remains unclear, genetics as key factor in development of supernumerary teeth is highlighted. Xeroderma pigmentosum is a rare disorder transmitted in an autosomal recessive manner. It is characterized by photosensitivity, pigmentary changes, premature skin aging, and malignant tumor development. The frequency of this disorder is approximately 1 case per 250.000 population. Two important causes of mortality are metastatic malignant melanoma and squamous cell carcinoma. Here xeroderma pigmentosum in three siblings presenting with variable expressions is reported. The seventy of the condition was more in one of the more sun exposed sibling and had more signs of malignant lesions. Intraoral pigmentation was also present in all the three siblings. Neurofibroma is a benign tumor of neural tissue origin. It most frequently involves the skin and rarely the oral mucosa. The nature of the disease has been recognized as hereditary with an autosomal dominant trait with variable penetrance. It has been reported to occur 1 in every 3000 births. The oral lesions occur as discrete, nonulcerated nodules, which tend to be of the same color as the normal mucosa- Usually occurs on the buccal mucosa, palate, alveolar mucosa, vestibule and the tongue. An interesting case of asymptomatic swelling of the lower lip since 20 years is presented. The swelling was gradual in onset and slowly increased in size in the first year of its appearance, there after there was no increase in size of the swelling and it remained stable until the patient reported at our clinic. It was a solitary diffuse, lobulated swelling of lower lip extending distally from left commissure, menially crossing the midline, anteriorly from vermillion border of lower lip, posteriorly extending into labial vestibule. Excisional biopsy was performed and histological examination revealed interlacing fascicles of elongated cells with very dark staining nuclei and focal areas resembling Antoni A pattern, which confirmed the lesion to be neurofibroma of lip. Dentigerous cysts are the most common developmental cysts of the jaws, most frequently associated with impacted mandibular third molar teeth. Bilateral dentigerous cysts are rare and occur typically in association with a developmental syndrome. The reported occurrence of bilateral dentigerous cysts in the absence of a syndrome is rare and, to date, only 17 cases have been described. The following is a report of a case of unusual bilateral nonsyndromic dentigerous cysts associated with developing mandibular second premolars and a review of literature.